Payette Custom Creations Blog: We're Moving....Again! Well, it's official that bittersweet time in our life has come once again, a time that we knew would be coming eventually. Our store will be closing it's Napanee location permanently and we will be relocating to another part of the country and re-opening in the Summer/Fall 2017. We have really enjoyed being part of this area and this community for the past 4 years and will be very sad to go. There are so many great people, organizations and events around here, I am really going to miss it. Upon closing the store we will have everything that is currently in store marked down to 25% off, we do not want to move these items across the country, please help us by spreading the word of our sale and help us move these products out. We will not be taking on any new custom orders at this time, with the exception of a few pairs of socks that we currently have blanks ready to be turned into something fun and quirky for the bottom of your feet. Please visit the website frequently for any "new" items that have yet to be posted. 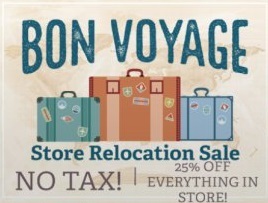 Everything is 25% off and TAX FREE!! !